Type 2 diabetic patients are at an increased risk of developing liver diseases owing to the nature of the disease and its inherent complications. Elevated serum activities of the liver enzymes are the most frequent indicators of liver disease. The purpose of this study was to determine the pattern of abnormal serum liver enzymes activities in type 2 diabetic individuals. The study comprised of 170 type 2 diabetic patients attending Medical Outpatients Department of Ahmadu Bello University Teaching Hospital, Zaria. Diabetes mellitus (DM) was confirmed according to the new diagnostic criteria based on 2 fasting or 2 random plasma glucose levels of more than 7.0 mmol/L and 11.1 mmol/L respectively. A concise history of the patients, physical examination and laboratory findings were recorded on a proforma. Serum alanine aminotransferase (ALT) and aspartate aminotransferase (AST) activities were measured using the kinetic method of IFCC. Serum gamma glutamyl transferase (GGT) activities were measured using the kinetic method of SZASZ. Serum alkaline phosphatase (ALP) activities were measured using the colorimetric method of King and Amstrong. The concentrations of serum FBG and RBG were measured using glucose oxidase method of Trinder. One hundred and eighteen (69.4 %), 46 (27.1 %), 26 (15.3 %) and 51 (30.0 %) of patients had mild increases in serum levels of AST, ALT, GGT, and ALP respectively. In addition 42 (24.5 %) patients had both mild increases of AST-ALT and 10 (5.9%) had mild increases of all the liver enzymes activities. It can be concluded from the findings of the present study that there is chronic mild increases in serum liver enzymes activities in diabetic patients therefore, liver function tests (LFTs) be included into routine laboratory investigations of DM in Nigerian hospitals. Diabetes mellitus (DM) is a systemic disease caused by absolute or relative deficiency of insulin and is manifested by disorders of carbohydrates, lipid and protein metabolism1. The prevalence of diabetes is high in patients who have liver disease such as non alcoholic fatty liver disease (NAFLD), chronic viral hepatitis, haemochromatosis alcoholic liver disease and cirrhosis. Similar studies have shown that DM plays a significant role in the initiation and progression of liver injury (Hickman IJ and MacDonald GA, 2007). hepatitis and chronic persistent hepatitis. All cases except Schistosomal liver fibrosis tested positive to serum hepatitis B surface antigen. The hallmark of the disease is fasting hyperglycemia (WHO; Geneva, 1999) and studies have shown that liver plays a critical role in carbohydrate homeostasis and insulin degradation therefore, it is not surprising that it’s function may be affected by DM (Hanley et al. 2004). Association exists between DM and liver injury (Meltzer A and Everhart JE 1997). There are evidences have revealed that patients with type 2 DM have two times the risk of developing liver diseases than their healthy counterparts (Karen Barrow, 2005). Hsiao et al;2007 reported that alanine aminotransferase (ALT), aspartate aminotransferase (AST) and gamma glutamyltransferase (GGT) were associated with insulin resistance (IR) as glycaemic status progresses in the impaired fasting glucose group. Liver disorders among diabetics is similar to that of alcoholic liver disease including fatty liver (steatosis), steatohepatitis, fibrosis and cirrhosis. Elevated serum activities of the liver enzymes such as aspartate aminotransferase (AST), alanine aminotransferase(ALT), alkaline phosphatase (ALP) and gamma glutamyltrasferase(GGT) are the most frequent indicators of liver disease and occur in diabetics more frequently than in healthy individuals Hsiao et al; 2007.The aim of the present study was to determine the pattern of abnormal liver enzyme activities in type II diabetic patients in Zaria , Northern Nigeria. using sterile technique. The blood was centrifuged and the serum was carefully drawn into sample bottles and then stored frozen at -200C until the time for analysis. The samples were analyzed for plasma glycatedheamoglobin (GHbA1c) using the method of Triveli et al; 971 and Fasting Blood Glucose (FBG) as well as Random Blood Glucose (RBG) using the method of Trinder 1964..
Statistical analysis was performed using statistical package for social sciences (SPSS) for Windows, version 15.0. Data were presented as Mean±SEM. plasma glycated heamoglobin (GHbA1c) levels and serum Fasting Blood Glucose (FBG) as well as Random Blood Glucose (RBG) levels were compared with those of the apparently individuals using two tailed student t-test. A p-value of equal to or less than 0.05 (p=0.05) was considered as statistically significant. The results of clinical parameters are presented in table I. The differences in weight and body mass index (BMI) between diabetic subjects and controls were statistically significant. Plasma GHbA1c and serum FBG as well as RBG in diabetic patients and controls are presented in table II. The mean values of plasma GHbA1c and serum FBG as well as RBG were significantly higher in diabetic patients than the control subjects (p<0.01). The result of pattern of abnormal liver enzymes activities are presented in Table II. One hundred and eighteen (69.4 %) , 46 (27.1 %), 26 (15.3 %) and 51 (30.0 %) of patients had mild increases in serum levels of AST, ALT, GGT, and ALP respectively. Similarly, in the control subjects, 33 (41.3 %), 1 (1.3 %) 27 (36 %) 11 (13.8 %) individuals also had mild increase in serum levels of AST, ALT, GGT and ALP respectively. The results obtained in the present study showed that the percentage prevalence of abnormal serum liver enzymes activities were significantly higher in diabetic patients than in control subjects. The finding of the present study was similar with those of Salmela et al; 1984 and Erbey et al; 2000 as seen in (table II). Even though there were variations in the values of percentage prevalence reported by the above mention authors as well as the present study however, the values were higher in diabetic patients than in control subjects. The high percentage prevalence of elevated liver enzyme activities in type II diabetic patients seen in the present study suggest that the liver is diseased. It was reported that elevation of serum activities of the liver enzymes such as aspartate aminotransferase (AST), alanine aminotransferase (ALT), alkaline phosphatase (ALP) and gamma glutamyltrasferase (GGT) are the most frequent indicators of liver disease (Monica et al 2005 and Meltzer A, Everhart JE 1997) therefore, the high percentage prevalence of elevated liver enzyme activities in type II diabetic patients as well as the higher mean level liver enzyme activities in type II DM than control subjects seen in the present study further confirm the abnormalities of liver function in type II DM. The hallmark of type 2 DM is hyperglycaemia and it leads to fat accumulation in the liver14. Fat accumulation is known to be directly toxic to hepatocytes . 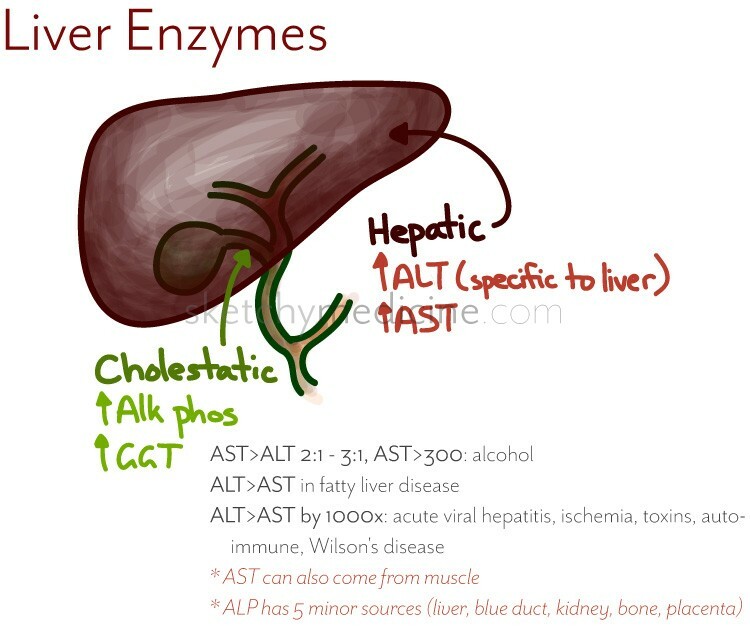 An elevation of liver enzymes such as ALT and GGT even within the normal range, reflects deposition of excess fat in the liver (Meybodi et al 2008 and Maryam et al 2008). This may be responsible for the increased serum activities of transaminases seen in the present study. Zachary, 2007stated that fat accumulation in the liver also stimulates the release of inflammatory cytokines such as tumor necrosis factor-α (TNF) and interleukine-6 (IL-6) which may contribute to hepatocellular injury. This might also result to increased serum activities of transaminases in the present study. Hyperglycemia leads to myoinositol depletion in several tissues susceptible to diabetic complications (for example liver), although the exact mechanism is unclear. The fall in myoinositol levels in the cell membrane alters the functioning of Na+/K+ ATPase pump and the integrity of the cell membrane is impaired (Malnick et al; 2003). Clinical observations and experimental studies have shown that subtle changes of cell membrane are sufficient to allow passage of intracellular enzymes such as AST and ALT to the extracellular space with subsequent elevation of their levels in plasma (Malnick et al; 2003). This could be another reason for increased serum activities of transaminases in the present study. Monica et al; 2005 reported that ALT, ALP and GGT were associated with prevalent type 2 DM and AST with prevalent IGT). NAFLD is a complication in 32%-78% of patients with type 2 DM and 50% of these patients may have NASH. Some studies demonstrated that hyperglycemia and hyperinsulinaemia can promote fatty infiltration of the liver (De Marco et al 1999). It can be concluded from the findings of the present study that there were high prevalence abnormal liver enzyme activities in diabetic patients therefore, liver function tests (LFTs) should be included into routine laboratory investigations of DM in Nigerian hospitals. We acknowledged the assistance of University Board of Research of Ahmadu Bello University, Zaria. We thank Dr IS Aliyu, Head of Chemical Pathology Department of Ahmadu Bello University Teaching Hospital (ABUTH), Zaria for his constant advice and encouragement during this study. We are also grateful to Dr Muazu Babura of the Department Medicine of ABUTH, Zaria for his assistance during the course of this work. We also thank Mal. MA Auwal and of the Department of Chemical Pathology ABUTH, Zaria for his assistance in analysis and other logistics.